Reception counters, service counters and info counters are often where your customers will have their first experience of the service your company offers. A major part of the customer experience is, of course, the friendliness of the personnel, but the significance of the reception counter itself should not be underestimated. Customers feel more comfortable in a space that works well and creates a positive first impression. Koralli manufactures specialist furnishings for companies’ reception spaces, foyers and other public spaces, always on a project and made-to-measure basis. 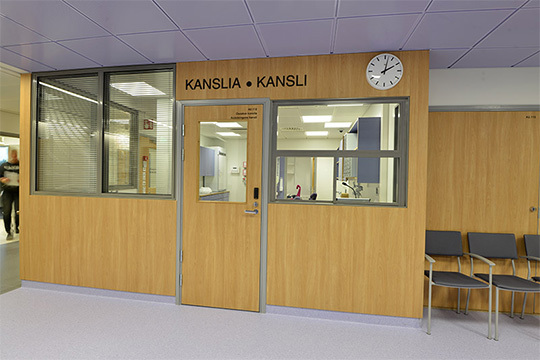 Specialist furnishings very often include solutions for companies’ foyer spaces, such as reception counters, info counters or customer service counters. As first impressions are often created at the reception counter, such locations can prove challenging and designers must be able to implement fitted furnishings in a way that is in keeping with the company’s visual identity and the architecture of the public space. This requires the kind of expertise that Koralli provides. We know just the right materials and technologies to use to turn designers’ visions into realities. We work in close and smooth collaboration with designers and builders. Often, a functional solution is only completed at the realisation stage. Good collaboration with architects and designers has allowed us to create high-quality specialist products, bringing together the designer’s objectives and the work of top professionals. 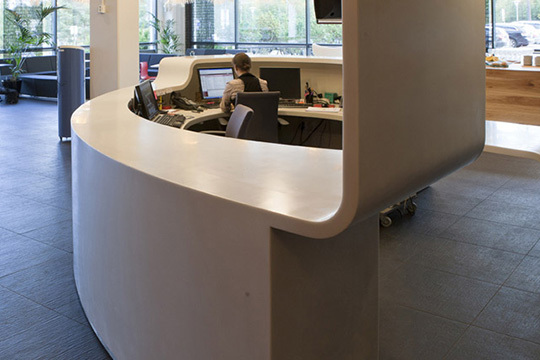 If you are looking for functional spaces and high-quality, fitted reception counters, get in touch!